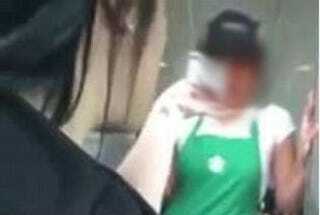 Elizabeth Becerra confronts a California Starbucks employee who she believes stole her credit card. A Victoriaville, Calif., woman posted video of a confrontation she had with a Starbucks employee who she claims stole her credit card information and then spent over $200 at a local grocery store. According to the Daily Mail, Elizabeth Becerra was visiting a Starbucks store on New Year's Day when, she claims, a worker told her to wait while she retrieved receipt paper from the back of the store. Becerra believes that while the worker was in the back, she made a copy of her credit card information. Becerra and a male friend returned to the store days later to confront the employee after she noticed a $212 charge on her account at Ralph's grocery store. The video (NSFW) shows Becerra approach the employee at the drive-thru Starbucks window. "So we got you on camera yesterday at Ralph's for $212, so just know that the cops are coming up here," she says to the woman. Becerra tells the woman that the shopping trip was recorded and that she has informed not only the police but also the corporate headquarters of Starbucks. The woman appears shocked and immediately begins apologizing. "I am a good child. I swear I am really good," the employee tells Becerra. "I really do go to school. I'm 19. I play soccer." The cashier then begs Becerra not to press charges and offers to return the money. But Becerra cuts her off: "You went through the $212. You come to Starbucks to get coffee, not to get robbed." The video was posted on Facebook with a warning: "This happened in Lakewood folks keep an eye on your cards."